Public facilities in major part contribute to our community’s future through architectural layout and location. Continuing to locate such facilities in town simply helps ensure continued vibrancy. Communities that see vacant buildings as an asset, a challenge and an opportunity to fill ensure that such vibrancy will continue. Communities that regard vacant buildings as “eyesores” and demolish them without due consideration, in turn, fragment the town center. These vacancies are often known as the “broken tooth” problem. Urban renewal was a huge failure in the 1960s and repeating this error by demolishing potentially serviceable buildings in the 21st century is replacing a potential business with a vacant lot. With this in mind, the strong potential for adaptive use and maintenance of historic in-town facilities can better facilitate an intact townscape. When in-town facilities are relocated outside of town, the community risks owning underused facilities, or creating a distressed town center full of significant architectural gaps. Two projects that serve as an example of the successful reuse of such buildings to house important community facilities follow. A Good Example: Gray Town Hall On Maine Preservation’s 2008 Most Endangered List, the Pennell Institute demonstrates how a vacant historic building can be successfully repurposed to serve the community and ensure the longevity of local architectural fabric. In 2008, after several years of population growth, Gray was faced with the problem of space restraints in its town hall. Rather than resorting to new construction, town-wide surveys were taken to determine which existing building in Gray would serve well as a replacement. This process also included a complete analysis conducted by the Community Economic Development Committee (CEDC) to confirm the economic viability of local options. On November 4, 2008 the town of Gray voted that the Pennell Institute would make an appropriate town hall. Gray’s citizens understood the importance in preserving the 136 year -old Pennell Institute. As a busy, occupied building, the ongoing maintenance of this historically significant resource will continue. A Good Example: South Berwick Library The Friends of the South Berwick Library’s ongoing project to convert St. Michael’s Church into the town library is another success story. Still in progress, the friends are working to fund construction needed to transform the church sanctuary into the library’s main space. Together with an addition already built, the library will accommodate 6,800 square-feet for library collections. By using this building – located within walking distance of downtown, Central Elementary School, and a future senior housing building – the library will help redefine the “town square” for the community. 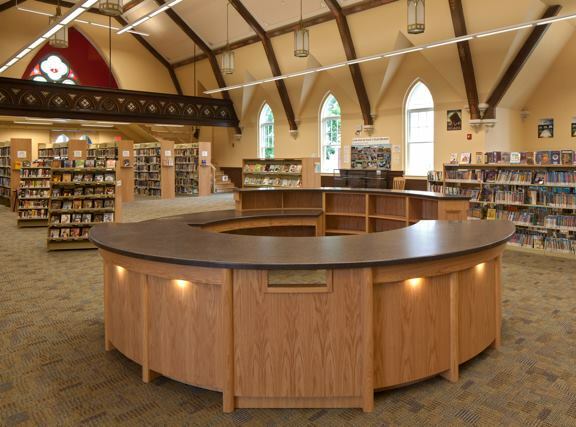 By effectively ensuring the preservation of the St. Michael’s church, now as a library, the downtown area of South Berwick will continue to thrive. • Rather than relying on new construction on the edge of town, a community evaluates existing buildings, located in town, which could house public facility operations. In turn, such buildings can serve as a symbol of town pride and assist in continued prosperity. • Citizens understand the economic benefits of retaining public facilities within in-town locations. Underuse can be negative consequence when community members are forced to travel by vehicle to out-of-the-way facilities, away from centers of vibrant community life. • Clear, open dialogue among the community is vital. This can take many forms, as is seen by Gray’s efforts to use the CEDC to distribute surveys and South Berwick’s forming of an open group.